UNITED NATIONS, Aug 3 2018 (IPS) - Sustainability, stability, and security—the three overlapping issues are an increasing concern among many especially in Africa where land degradation is displacing citizens and livelihoods. African ministers and United Nations officials convened at the U.N. as part of the Initiative on Sustainability, Stability, and Security (3S), which aims to address migration and instability caused by land degradation across the continent. “We need to take ownership of our responsibility,” said minister of environment and sustainable development of Senegal Mame Thierno Dieng. The west African nation was one of the countries that helped launch the 3S initiative. "We need to ensure people have jobs within their communities and environment. We want them to stay on their farms and farm." -- Ghana’s deputy-minister of environment, science, technology, and innovation Patricia Appiagyei. Among its objectives, 3S hopes to stabilise “at risk” areas by creating new, green jobs for the most vulnerable communities through investments on land rehabilitation and sustainable land management. Without any such action, the dangers for communities are undeniable. Globally, 80 percent of land degradation is caused by agriculture. Since 1950, 65 percent of Africa’s cropland, which millions depend on, has been affected by land degradation by mining, poor farming practices, and illegal logging. Meanwhile, an estimated 375 million young Africans are estimated to enter the job market within the next 15 years. Of this population, 200 million will live in rural areas. As resource-based sectors such as agriculture account for 80 percent of employment, young people will be left without a healthy environment to survive on. According to 3S, this could lead to conflict over natural resources, instability caused by the lack of income-generating opportunities, and increased exposure to extremist groups. Ghana, renowned for its tropical forests and cocoa farms, is already seeing this scenario play out. Approximately 35 percent of the west African country’s land is under threat of desertification especially in the north where land degradation and climate change have exacerbated poverty. 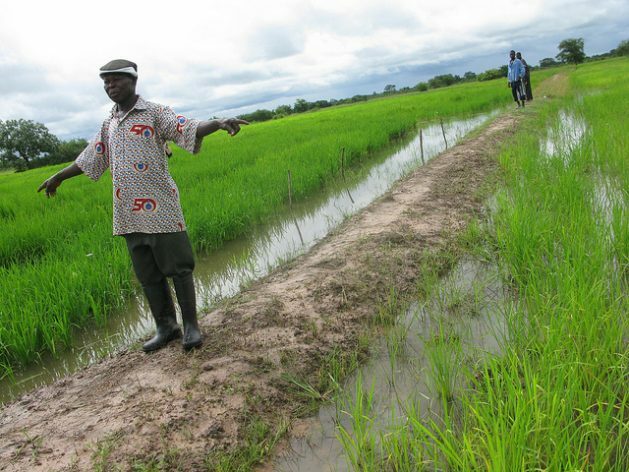 Croplands that were once fertile in northern Ghana are now unproductive, which has led to decreased incomes while water sources are drying up due to prolonged droughts. Such losses have forced northern residents to migrate to the southern region of the country where they live in “highly deplorable” conditions, Ghana’s deputy-minister of environment, science, technology, and innovation Patricia Appiagyei told IPS. “It is about time that we find ways of ensuring we neutralise the high rate of degradation,” she said. “[3S] is an initiative we are very passionate about and we believe that we need to join to address these issues because land degradation and desertification issues is not just affecting the land but it is also affecting water, energy, food baskets, and livelihoods of the people who live within those communities,” Appiagyei continued. While Ghana has begun investing in agricultural development in the north, conflicts are beginning to escalate between farmers and herders who are losing grazing land for their cattle. The Gambia is facing similar challenges, with almost 80 percent of its woodlands degraded in alongside a rapid decrease in the productivity of its cropland. As 64 percent of its population are young people, Gambians have been forced to move to urban areas or abroad for greener pastures. Many Gambians have also been returning which is proving to be an additional challenge, said minister of environment, climate change, and natural resources Lamin Dibba to IPS. “There was a particular month that there were about 400 people returning from abroad. This is very worrying for the fact that when they stay long without any livelihood support system, this can bring a lot of social disorder,” he said. In an effort to avoid such instability, the Gambia hopes to create 25,000 green jobs for youth in their communities as well as returning migrants in the fields of agriculture, tourism, and conservation. To achieve this, education is a crucial component, both Appiagyei and Dibba said. “[We need] to reach out to the communities to explain to them what is climate change, what are the causes, what are the likely impacts…this is why we call it integrated—we want to look at all aspects of people’s livelihoods,” Dibba said. Supported by the Great Green Wall (GGW) initiative, the Gambia is implementing an education project targeting schools about GGW and land restoration methods. Appiagyei noted the importance of including farmers, especially women, in such initiatives through education on agricultural practices and new technologies. “They are currently suffering from the agricultural practices they are undertaking and the weather doesn’t really help…we need to ensure people have jobs within their communities and environment. We want them to stay on their farms and farm,” she said. While Ghana is considering a lift on a ban on small-scale mining, which has impacted swathes of forests and water bodies, Appiagyei told IPS that sustainable land management comes first. “We are thinking about lifting the ban, but not until we are able to improve on land management practices and apply the right legislation. Not until we are convinced that we have the right measures to curb the activities of small-scale illegal mining,” she said. But no one of this will be possible without meetings and support from the international level. “We want to ensure these projects become a reality,” said Dibba.